Too cute! I’ve made cat houses out of cardboard, but nothing as nifty as this. 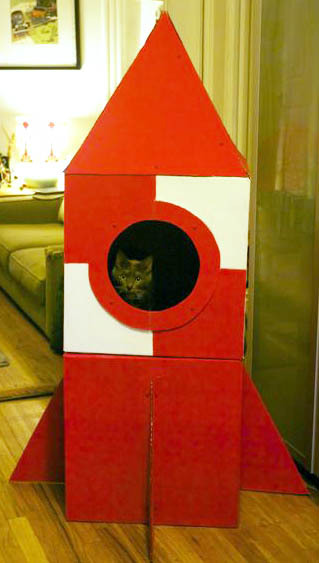 Check out the superb cardboard rocket tutorial at Craftzine from Haley Pierson-Cox, who has her own site, The Zen of Making full of DIY goodness. There are even carpet squares for each level. Haley uses actual screws and nuts to hold the rocket together, for the most part, instead of glue, which gives the rocket more structural integrity and avoids exposing your kitty friends to any chemicals in the glue. I don’t know how much of an issue that is unless your cat eats glue, but I do like how the hardware looks in the final product. Have fun—your kitty will be over the moon! I think this happens every Fall. The days start getting shorter and somehow my I’ve-Got-To-Make-Something! button gets pushed. 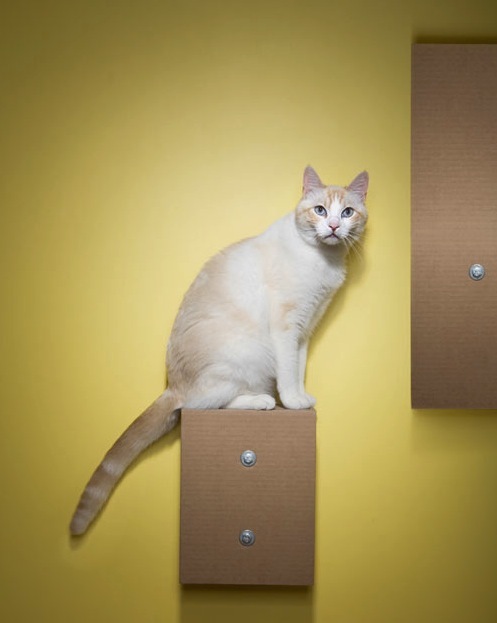 Here’s the first DIY post in a long time—how to make a cardboard cat “tower” that hangs on your wall. This is a great idea, since it doesn’t take up floor space, doubles as a cat scratcher, doesn’t cost much to make, can be customized, and can double as art. How cool is that?! You can use cardboard you have or you you can buy sheets of it. I would treat the “face” of the cardboard (the part that faces the room) so that it’s more aesthetically pleasing by painting it or by applying wallpaper, decorative paper, or fabric. This tutorial shows how to make your cat a happy camper! Corrugated cardboard pads measuring 36″×48″ (The tutorial notes these are available in bundles of 50 from http://www.uline.com/.) Or you can use what you have on hand as long as you have enough to make your piece 35 sheets thick. You may have to adjust the shapes you make depending on what you have. 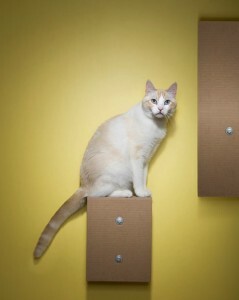 I’ve always thought I should make my own cat scratchers out of the cardboard boxes we have collected. It seems crazy to buy cardboard scratchers , because–Hello?! You want how much for what’s basically pieces of cardboard glued together??!! But, I also wasn’t thrilled with the prospect of hot-gluing a bazillion strips of cardboard myself. That would seriously get in the way of reading the subtitles for the Korean dramas to which I’ve gotten addicted. 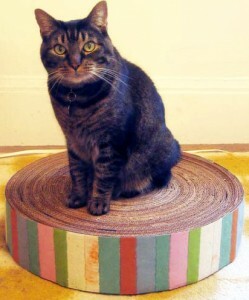 This lovely tutorial is for a round cat scratcher! You have to coil the strips of cardboard tightly and then just tape the ends. Sweet! I can do that and read subtitles–no problem! You can decorate the outside edge of the scratcher too so it doesn’t look like some freaky hunk of cardboard in your living room. It’ll look like a decorated freaky hunk of cardboard!